"On February 27, 1914, shortly after midday, we started down the River of Doubt into the unknown. We were quite uncertain whether after a week we should find ourselves in the Gy-Parana, or after six weeks in the Madeira, or after three months we knew not where." So wrote Theodore Roosevelt to open Chapter VIII of his book, Through the Brazilian Wilderness, a remarkable diary of his experiences and survival traversing an uncharted sector of the vast Amazon basin. Nearly 100 years later, the Rio Roosevelt, as it is now called, remains one of the most pristine rivers in Amazonia, coursing through hundreds of kilometers of undisturbed forest. The river is as inaccessible as it was in Roosevelt's day--except for one point in far southern Amazonas state just above the Mato Grosso border: the beautiful Pousada Rio Roosevelt. We're ready to take you birding there! The pousada was founded a few years ago to cater to sport (catch-and-release) fishermen looking to get into some of the best fishing in the Amazon. The owner has also invited a number of birding tour companies to visit the pousada, hoping to attract birders looking to get into remote wilderness and some of the best birding in the Amazon--folks like us! The pousada is a small, exclusive place, featuring six cabanas with AC and private bathrooms with hot water, and a great bar and kitchen. In short, it's a truly luxurious headquarters for a week of exciting birding--Teddy would have sooo loved it! But that's not all. 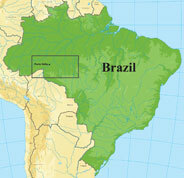 The tour starts in Porto Velho, capital of the state of Rondonia, on the east bank of the great Rio Madeira. Thus, we'll jump out of the blocks with three days of birding along the Madeira, longest tributary of the Amazon and a major divider of avian populations in the Amazon basin. We'll strive to see the difficult Ocellated Crake and a large number of other species that do not occur on the Rio Roosevelt. To get yourself primed for this tour, read Candice Millard's The River of Doubt: Theodore Roosevelt's Darkest Journey (and Teddy's first-hand account, cited above, if you're really into it), check out the pousada's website online, then join Bret and a small group for a fantastic journey to the Rio Roosevelt that's sure to be fun: no doubt about that! Read or download formal descriptions from the "Special Volume" of the Handbook of Birds of the World (July 2013) of 15 new species of Amazonian birds, some of which may be found on this tour. Also available is the introduction to this chapter of the book in which Bret Whitney and Mario Cohn-Haft provide perspectives on new species discoveries across the Amazon basin. Good to fine accommodations, easy to moderate terrain, warm to hot climate.